Is it worth paying to see Gaudí’s Park Guell in Barcelona? 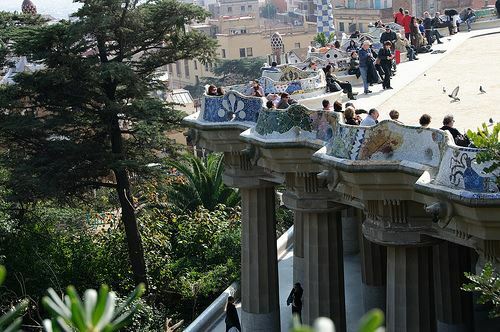 1 Why Visit the Park Guell in Barcelona? For starters, it is one of architect Antoni Gaudí’s most interesting works. We love the Modernist touch and his wild combinations of influences (Romanesque, Moorish and Gothic) and materials (ceramic tile and rough stone sculptures). We love the curved paths, the mosaic animals, the iconic park benches and bridges that cross over each other at different levels. The park has some of the best views of the city. It’s a must for anybody interested in Gaudí architecture and interiors. 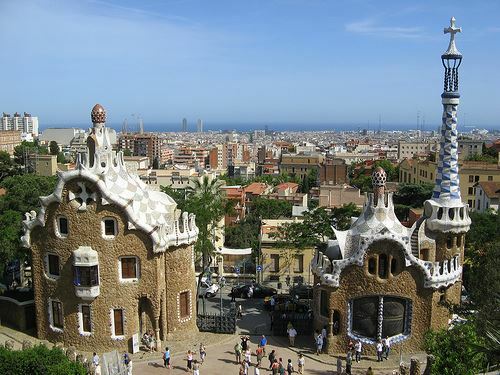 2 Did you know Park Guell in Barcelona was originally a housing development? The park was designed by Gaudí for the Catalan entrepreneur Eusebi Güell. Work commenced on what was to be an exclusive housing development on the outskirts of Barcelona in 1900. Unfortunately for both, their project wasn’t popular with the elite of the time and just two of the planned 60 houses were built. Gaudí bought one of the show houses in 1906 and continued working on the project until 1914. A few years after Count Eusebi Güell’s death in 1918, his family gave the land to the city. It was opened as a public park in 1926 – the year of Gaudí’s death. In 1984, it was added to the list of UNESCO heritage sites and it attracted 9 million visitors annually until an entrance fee was charged. It now attracts almost 3 million fee-paying visitors. 3 How to get to Park Guell in Barcelona? The park is just 4km north west of the city centre and the views of the city and the coast are spectacular. We recommend starting the day with a visit to the park and leaving the Sagrada Familia for the afternoon (the sites are just 2.3km apart – you’ll see the Sagrada’s spires from the park!). To get to the park you can take Bus 24 from central locations such as Placa de Catalunya or Passeig de Gracia – it’s about a 30-minute ride and you get dropped off at the top (unlike the metro stop which is at the foot of the hill). We usually recommend you leave an hour or so to enjoy this park. There are refreshments and sandwiches for sale within the park at the two cafes. So if you have some extra time – do enjoy the extra space and the creativity. Soak up its views of the city and the ambition of two of Barcelona’s visionaries. 4 Not yet convinced? This will do it! 5 Want to experience the Gaudí magic? Here’s how to get your tickets! Tickets for Park Güell can be pre-booked online three months in advance of your visit. 400 tickets are released for each 30-minute time-band. So if you book a ticket for 10am, you can gain entrance to the restricted zone from 10am until 10.30am. Opening times vary depending on the time of year but in high season, for example, you can enter the restricted zone at 8am and don’t have to leave it until 9.30pm! That said, we think an hour or 90 minutes is probably the length of time you’ll need to get around the space. Tickets can be ordered online here and cost 7.50 EUR per person in advance, with reductions for older children and seniors. Kids under 7, people with disabilities and locals are free (but they will still need to book a place). Tickets cost 8.50 EUR at the park (if available). 6 Need assistance with your trip to Barcelona and the region of Catalonia? 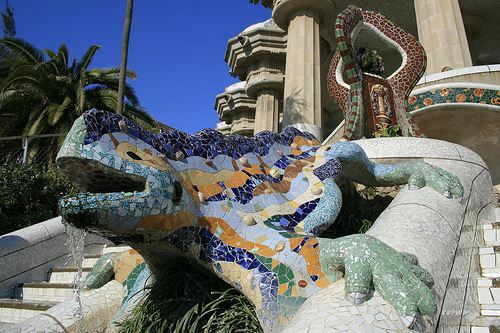 Check out our handy guide on Gaudi’s Barcelona and what to else to see in Barcelona and Catalonia including Salvador Dali’s Catalonia and the charming Costa Brava. Pro-Tip: if you want to explore the region yet don’t fancy driving in Spain, learn about the benefits of hiring a private driver and expert guide to see this and Spain’s other amazing attractions. Posted in Barcelona, Gaudí, General Tickets, Insider Spain Guides, Popular Posts and tagged architecture, Barcelona, chameleon, Eusebi Güell, Gaudi, Hansel and Gretel, Modernist, mosaic, online reservations, opening hours, Park Guell, pre-booking, tickets, trencadis, UNESCO.